Cultural Diplomacy: Restoring Value to Africa's Values and Traditions –from Leadership to traditional knowledge systems. The last year has seen significant changes for many countries in Africa, and the coming months may prove to have a defining impact on the future of African nations. This apparent zenith presents an excellent opportunity to take a look back at the continent's achievements, and consider the next steps for addressing its remaining and future challenges. Over the past five decades, significant effort has been put into Africa's development on multiple fronts, ranging from economic growth to social and political stabilization. This determination has seen credible results and promoted Africa's stance in the International arena. The last year produced the first African country to host a sporting World Cup; a resurgence of grass roots political will; the democratic birth of the World's newest country, and the growing influence and accessibility of digital technology. However, with the rapid economic and political trend towards a global society, and the arrival of new global challenges, such as climate change, water scarcity, and the growing gap between rich and poor, there is now an urgent need for innovative new strategies to ensure an equitable and sustainable future for the African continent. Further to this, Africa faces its own tests in achieving its development and self-advocacy on the world stage. Managing lingering political unrest in parts of the continent, how to reassert local culture and identity in the face of a growing global society, and in an age of interdependence, how the African Union can integrate further to create deeper pan-African cooperation. "The Rise of Africa" will explore the range of new ideas and initiatives being implemented in support of Africa's development, and assess the challenges and opportunities that will surface in the African continent in the near future. The program is open to applications from young professionals, students and scholars, civil society practitioners, private sector representatives, journalists, and other interested stakeholders from across the world. The application form for the conference can be accessed by clicking on "Conference Application Form" on the left-hand side. Speakers during the Conference will include leading figures and experts from international politics, academia, the diplomatic community, civil society and the private sector, from across the world. These speakers will include a number of individuals from the ICD Advisory Board (for further information about the Advisory Board please click here). All participants of the conference will be awarded an official certificate of attendance at the end of the program. This certificate will confirm attendance and provide details of the speakers who took part during the program and the topics discussed. Each certificate will be signed by members of the ICD's Advisory Board. (The ICD Advisory Board list can be found here). The seminar will be based in Berlin and will be hosted at a number of important political, historic, and cultural locations across the city. 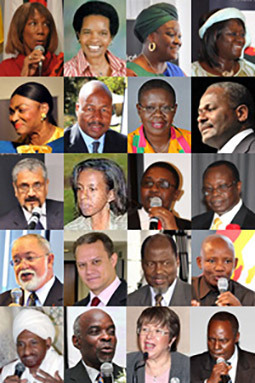 The International Symposium on Cultural Diplomacy in Africa 2011 will be covered by the "Berlin Calendar" Journalists. The "Berlin Calendar" is Co-hosted by NPR and the ICD. During the Symposium program, participants will have opportunities to network with one another, the speakers, and the ICD Advisory Board Members and partners. Symposium participants will become part of a growing international network of people from across the world with different fields of interest and levels of experience, who share a commitment to intercultural exchange. Participants will be able to remain in touch with each other through the ICD Networks.